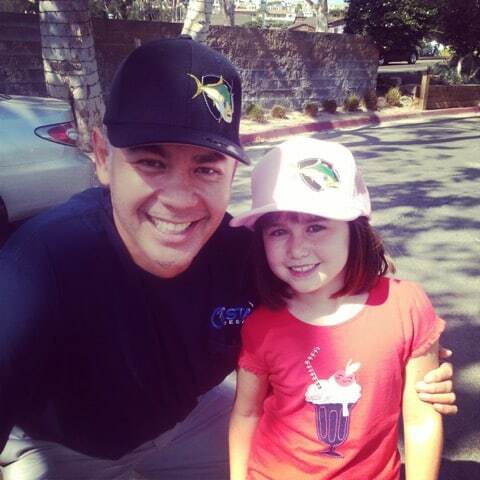 There are certain conventions to catching the various species of fish that we target here in Southern California. Based on the time of year, what they are eating, the conditions where you are fishing etc. There is likely a “best” way to catch the target species. But what do you do when they don’t want to bite? For a lot of people, it’s do the same thing, but with lighter line and/or smaller hooks. That’s one option. Not my favorite, but one that we’ve seen a lot this year, especially in response to the tight-lipped tuna we’ve had. I’m not talking about doing that though, I’m talking about really changing things up. Let me explain. 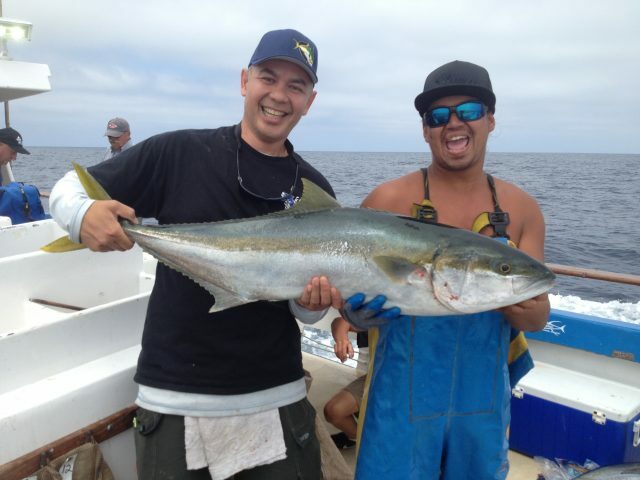 Last Summer, I was fishing on the Amigo out of Ventura Sportfishing. 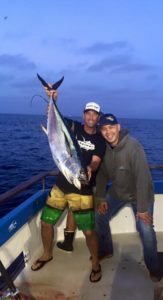 If you’ll remember back to last year, really warm water had extended far north, and catching tuna from the 805-based boats had become a reality. We anchored up in the dark on the Osborne Bank. We had one very small window on the tuna. Capt. Bill Cavanaugh said they would bite right before sunup and sure enough, they did. I was fortunate to get bit first and land the biggest fish. Later in the day, after giving up on offshore, we fished the kelp line by Santa Barbara Island looking for yellowtail. Everyone on the boat was flylining a bait hoping to score a yellow. With jackpot already in hand, I decided to work the bottom thinking a lingcod and a yellowfin on the same trip would be something rad to do. Just in case though, I tied a Spider Hitch loop, in the event something big found my bait. My buddy, deckhand Larry Ugale, was working the bait tank and offered me a pretty, lively, mint-colored sardine. Long story short, guess who ended up catching a big yellow on the dropper? This weekend I was on a 2-day trip aboard Eclipse Sportfishing. I was the chartermaster for an AFTCO sponsored trip. 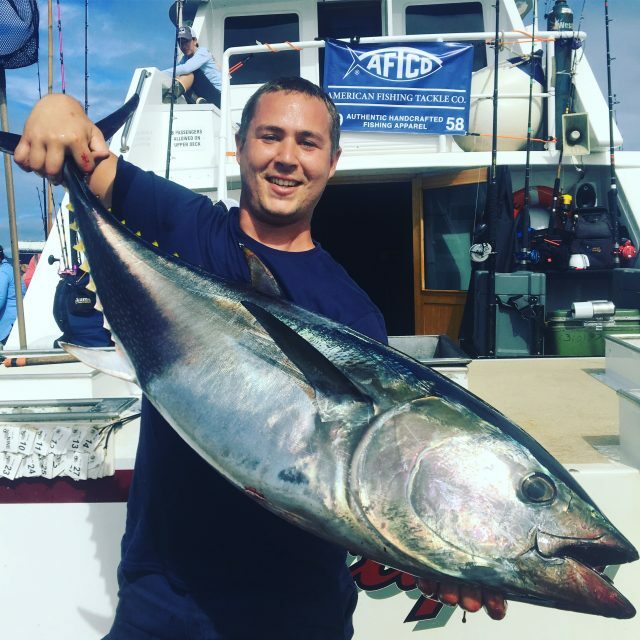 We ended up fishing around San Clemente Island where the tuna bite has been centered of late. I’ve been telling you guys for weeks that the light line, small hook setup is what’s been working. It definitely works for getting bit. After pulling too hard and busting off on 15 though, I went through my arsenal trying other things…the popper, colt sniper, rubber band rig, flatfall (Jimyjig version). None of it worked. My buddy, deckhand Anthony Cannulli, aka “Billy” was on the bait tank. Jig setup still in-hand, I looked over at Billy. Billy already had a Flatfall setup rigged and grabbed it. We were drifting on a long soak. The drift was on the port side, so we went on the starboard side of the stern and casted out. Our aim was to work the bottom and see what else our trip might offer. When we finally hit bottom, we started jigging. Billy quickly got bit. “Ooooh, I’m feeling some headshakes.” Billy said. Billy continued the fight and I lost track of him for awhile as he went up the rail to fight it. Minutes later, a cheer erupted. I gave my rod to someone so I could go look. Billy’s rockfish was a bluefin tuna (pictured top)! You just never know. It wasn’t the intended catch, but stranger things have happened. It ended up being the only bluefin caught on our trip. Moral of the story…if nothing else is working, dare to be different.